When it comes to getting older, staying mentally fit is just as important as staying physically fit. That’s because there is evidence that the more you keep your brain active, the less chance you’ll have of developing issues such as Alzheimer’s or dementia. 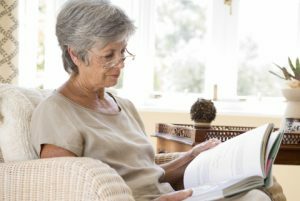 If you are a senior or are someone caring for a senior, there are plenty of ways to help keep that brain working long into those retirement years. Solving those crossword puzzle clues are a great way to exercise your brain. Look for your newspaper’s daily crossword, find them for free online, or pick up a crossword puzzle book at your local bookstore or grocery store. Having deep and meaningful conversations with friends and family is a great way not only to connect with them but to stimulate your brain. Go beyond the pleasantries and talk about things like travel, politics, your childhood, or other topics that interest you. Many newspapers are now running number puzzles like Sudoku right next to the daily crossword puzzle. Number puzzles work a different part of your brain, so doing both is a great brain workout. It’s never too late to learn a new language! If you’ve always wanted to learn French, Spanish or another world language, now is the time. There are plenty of great free apps that you can put on your phone or tablet, websites on the internet, or audio programs you can purchase online. Jigsaw puzzles are a great way to keep your spatial awareness sharp along with your mental abilities. Pick out a jigsaw puzzle with a picture or pattern that appeals to you and invite a few friends to help you out! Cards are great for mental stimulation as well as social interaction. Join a local bridge club or other card-playing groups; there is always room for beginners and people will be eager to show you the ropes. Stay up to date on your reading list! Books are a great way to have an adventure without ever leaving home. Pick a genre that appeals to you and pick up some great reads at your local used bookstore or library. Fancy writing your own book? It’s a great way to keep your brain working! Write your story on a computer or a old legal pad; you’ll get the same great benefits and exercise your creativity, too. Our home health care service in NJ loves to help seniors keep their brains active! Our caretakers are experienced with the physical, mental and emotional needs of seniors and we do our best to meet those needs however we can. Our team loves to work with seniors in their home, helping them retain their independence and age in place where they are comfortable and happy! If you are interested in learning more about our home health care services or just need some more ideas for staying mentally fit, get in touch with us by clicking on the button below.